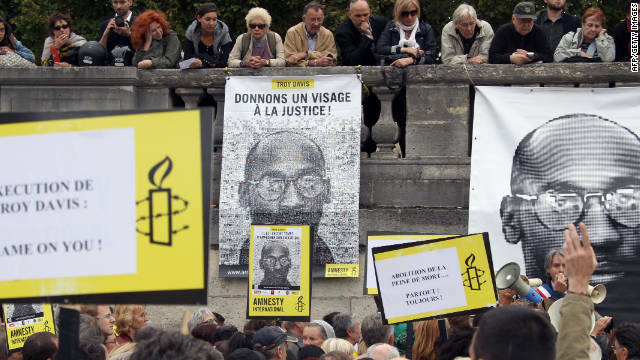 People hold placards on Wednesday during a demonstration in Paris against the execution of Troy Davis. Troy Davis may be dead, but his execution Thursday in the American state of Georgia has made him the poster boy for the global movement to end the death penalty. World figures, including Pope Benedict XVI and former U.S. President Jimmy Carter, human groups and commentators urged the execution to be halted - but to no avail. On Wednesday Davis was put to death by lethal injection for the 1989 killing of off-duty police officer Mark MacPhail despite doubts being raised over the conviction. The execution sparked angry reactions and protests in European capitals - as well as outrage on social media. "We strongly deplore that the numerous appeals for clemency were not heeded," the French foreign ministry said. "There are still serious doubts about his guilt," said Germany's junior minister for human rights Markus Loening. "An execution is irreversible - a judicial error can never be repaired." The European Union expressed "deep regret" over the execution and repeated its call for a universal moratorium on capital punishment. Next entry »Is the Egyptian-Israeli relationship over? Troy Davis' case will not be the last paradigm for retributive justice in this country! Justice served. It's a sad day, fellow Americans, get OUTRAGED over a killer having to actually pay his punishment. *I READ THE RECORD. * The FACTS are, your 7 "BLESSED" witnesses WOULD NOT go under oath to tell their "latest version" of the events. Why is that, if somebody's LIFE hung in the balance? The evidence linking both crimes WAS stupidly put in the same bag, yes. But, we're not talking about blood evidence here people. We're talking casings from bullets. As far as blood evidence, that WAS ruled out. Not because of the lack of it, but because the MOTHER of the killer, realized TOO LATE, that her son had hid the blood stained clothes in the house and that while SHE WILLINGLY let the police in her home, the only course to get it thrown out of court, was to use the lack of search warrant later. He shot a man in the face before killing the police officer, yet some of you blogged, that was "unconcerning" to the murder case at hand. I disagree. This isn't an INNOCENT, HARMLESS PERSON. He was evil. You allowed yourself to be his final victims. If you're against the death penalty, that's fine. I would suggest, you take that cause up. But remember, the victim of this case, was laid to rest in 1989. Not 2011. You are so evil...well it doesn't surprise me as I suspect your a member of KKK. My point is, we were not his jurors. We didn't sit in the courtroom and hear everything. We received a few statements and the majority of us, ran wild with it. I still believe in our Justice System. You must be a white rich guy, bc they are the only one who get get justice from this gross system. monica go home. You are illegal and mad about not getting your way. You dropped your kid and he is instant citizen and you are on welfare, food stamps, free school, and affirmative action. You are someones garden tool, learning how to be on welfare. We do need to reform the death penalty- we need to use it more often, clean up the appellate and evidence rules to get the innocent freed and the guilty dead faster, and make it part of a bigger legal overhaul. Our current justice system has been limping along for decades, and most of its assumptions haven't been challenged in generations. We've forgotten that the goal of a true JUSTICE system should be to execute as many murders and violent deviants (pedophiles, abductors, etc.) as maintaining reasonable level of due process. That's more that their victims get. What do you mean, "we need to use it more often"? And you want people to be less able to appeal against it? You're a total psychopath. You are even advocating death penalty for abductors? Seriously? Kidnapping should be a capital offense in your mind? Wow. Justice shouldn't be a body count or how many people it can execute quickly it should be about finding out the truth and dealing a punishment accordingly to the crime. Hey guys beautiful day today right? Civilized countries don't have the death penalty. Enough said. How can this country claim to be a leader of Human Rights? Does that only count if you're making over $250,000 a year? Christian America failed Troy Davis.